I don’t believe in the Wideman curse. 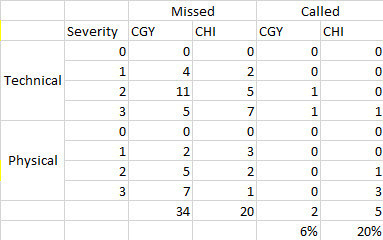 It isn’t that I refuse to acknowledge that the Flames are being penalized more heavily this season than last, but rather it is that I don’t believe it is entirely due to the incident where Dennis Wideman cross checked Don Henderson into the boards. Kerry Fraser wrote a piece in late January responding directly to the question of whether the Flames are being unfairly targeted by the officials because of Wideman. I’ve recommended it to not only Flames fans, but fans of any team. But back to the Wideman curse, the Flames are simultaneously receiving more penalties than any other team in the league (ahead of Colorado by 0.03 penalty kills per game) and being penalized at around a league-average rate of 18%. They are committing a greater number of infractions. those infractions which were called and which were uncalled. decided to repeat it again this season but over a longer period. the spectrum of strength of opposition. identify infractions, the severity and the two parties involved. on whether the infraction was a called penalty or not. interference, tripping, hooking, holding the stick, delay of game, and so on. • 0 is a phantom call. it would distract from the physicality and emotion of the game. apparent enough to warrant being enforced. interference, elbowing, cross-checking, slashing, and so on. jersey numbers of the players involved. 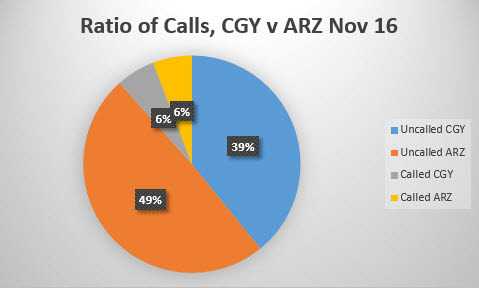 Bennett might look something like this: M, 2P Sl, 10, 93, 15:54.
compared to how often it isn’t I refer to as a Rate of Call (RoC). article so that anyone interested in reviewing it can do so. The graph below demonstrates the difference in the number of penalties called to either the Flames or their opposition based on the type and severity of each penalty, graded against an equal sized data set I collected from NHL games that did not feature either the Flames or the Oilers. The red line indicates how often the Flames would be penalized for a particular type of infraction, the black line the Flames’ opposition, and the gray line is the league average as determined by my control group. The Flames are close to league average in every category save the 3P category, egregious physical fouls. 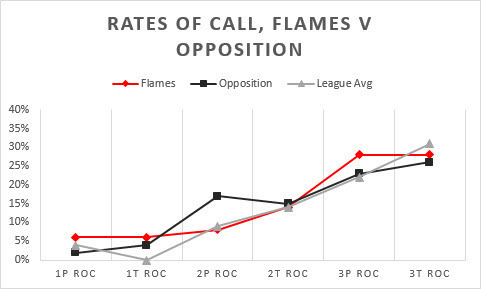 The Flames’ opposition, by comparison, is penalized far more often than the Flames or the league average when committing 2P infractions, fairly earned physical fouls. 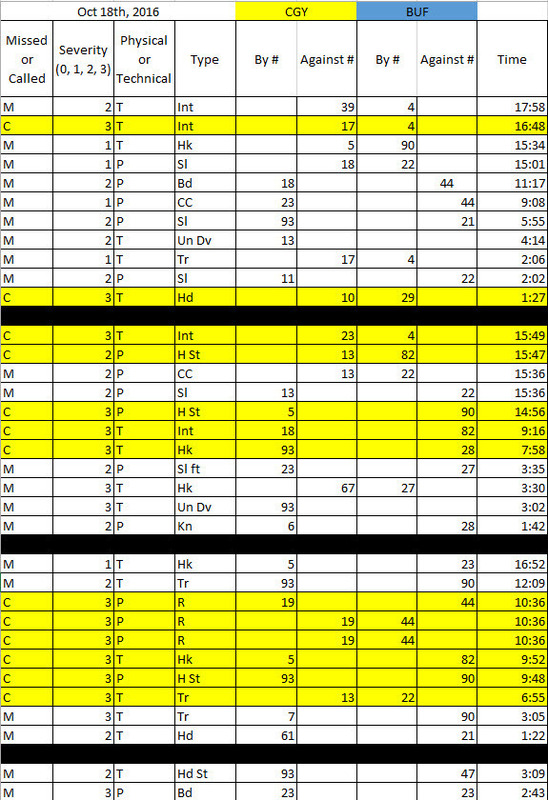 In collecting data on rule infractions I determine the percentage of times that a team is penalized for a particular family of infractions (technical or physical ranked by severity, ie: 2P, 3T, etc). This helps to wade through the mountains of information and generalize some events enough that we can see patterns without losing the details that give them context. In the end what I come up with is what I call a Rate of Call. Essentially it is taking the number of penalties meted out within a particular grouping, say 3P (blatant physical fouls) and then dividing that by the total number of those infractions committed, both called and uncalled. This tells you, again in general terms, how often an infraction from that range is likely to be called. It is by no means perfect, but it does help to weed out some of the situational circumstances which can blind the observer from making an objective call on the information. For interests’ sake, I checked and Sam Bennett was the most likely Flame to commit an infraction in those games that were reviewed while Matthew Tkachuk was the most likely to be targeted by the opposition. 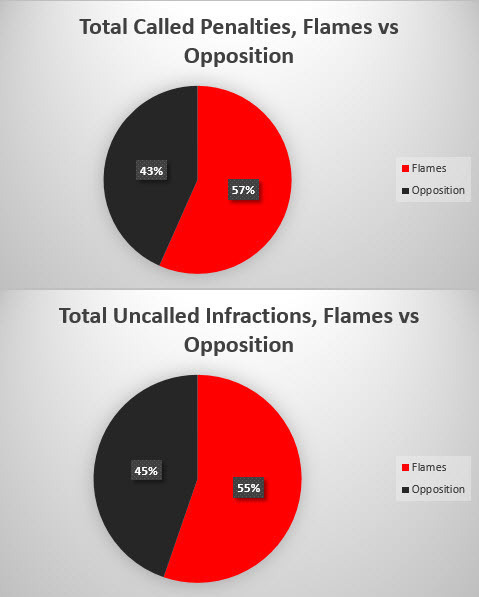 Below are charts that indicate the difference in infractions, called and uncalled, between the Flames and their opposition over the course of the games in question. 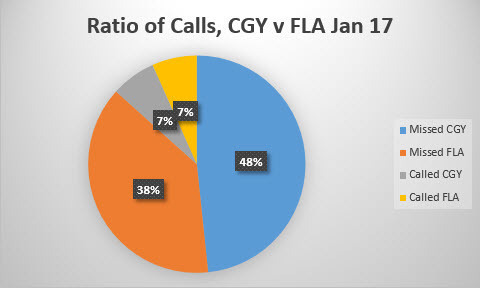 With the two pie charts below, the important thing to look for is the relative similarity of halves between the two charts, showing that penalties that were called were more or less in line with the infractions that were committed by the Flames and their opponents. Here are some raw numbers to put everything above into perspective. The charts above will suggest that the Flames are running about even with their opposition in terms of penalties, but the eye-test says that the Flames generally receive more penalties than their opposition. This is because the Flames commit a higher number of infractions than their opposition. 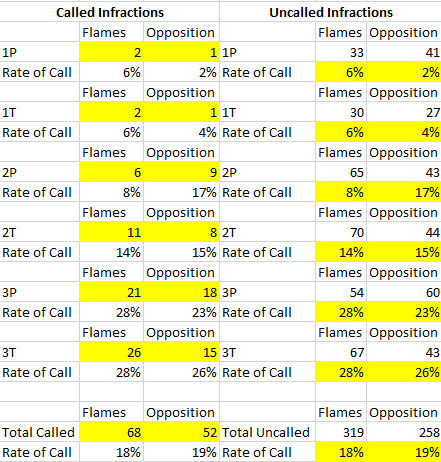 In other words, the Flames and their opponents both get called on 18% of the infractions they commit, but if the Flames commit 10 they’ll get 2 penalties while if their opposition commits 5 they’ll probably only get 1 penalty. 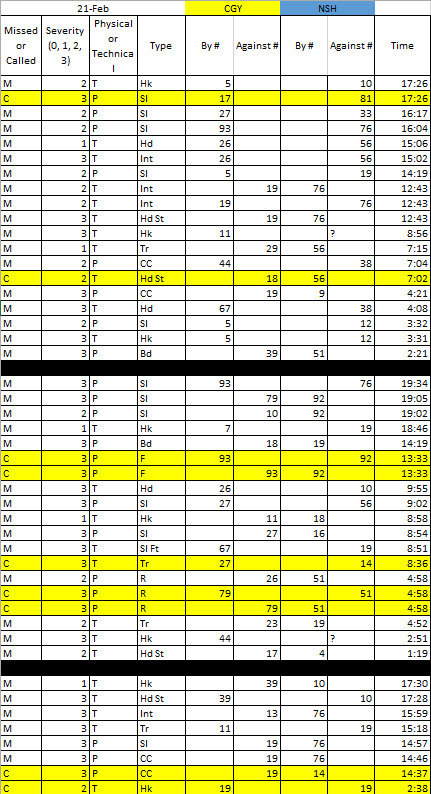 This table takes the numbers above and combines it with the above line chart that shows where the Flames and their opposition rate on the likelihood of being penalized for a particular family of infraction relative to what I’m observing from around the rest of the league. It appears to me that the Flames are being more heavily penalized this season because they are committing a greater number of punishable infractions. Under Bob Hartley the Flames played what I call a positionally aggressive system wherein they would forecheck heavily in the offensive zone and press closely on the opposition players with the puck in their own defensive zone, taking away time and space. Under Glen Gulutzan I would suggest they have retained that aggressiveness but are applying it with less discipline and distinction between being in position and simply being aggressive. Perhaps some of this is due to some players being out of position at times and resorting to committing infractions in order to regain a level of competitive advantage or to defuse an opposition possession. The much-discussed Wideman effect, does not readily appear in the data. However, Kerry Fraser’s opinion on this matter, outlined in the linked article, was that an official would not necessarily target a player by way of manufactured calls, but that that player would likely receive less situational leeway (ie: instead of a warning to stop holding an opponent the player is penalized, or that slashes are called by the book rather than separating what was intentional from merely within the flow of the game). Rarely does it extend to an entire team, in Fraser’s view, but that again, in those cases an official is more likely to call the rules by the book rather than fabricate penalties or focus solely on that team’s actions. 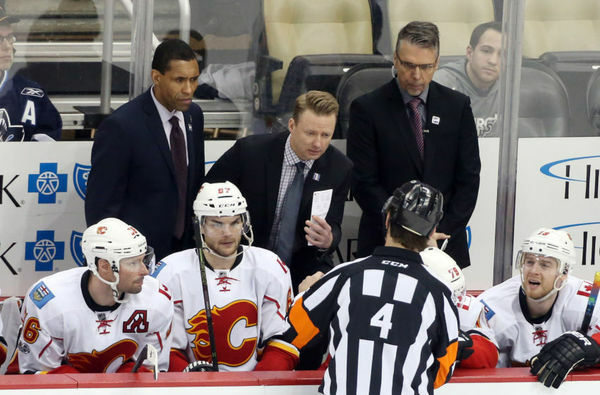 In the end, the Flames are an aggressive team built with that characteristic in mind. From what I have observed they are being treated as fairly by the officials as most any other within the NHL. As such, the penalties they have received this season they have largely earned by their own actions. 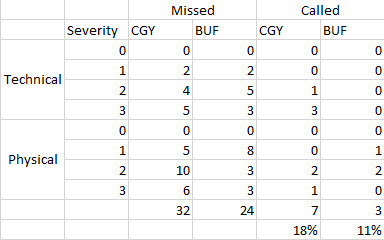 The following is the game-by-game data I collected along with some quick information on each such as the most “active” Flames player to commit infractions and the Flame most targeted by the opposition. on top of that (12%). 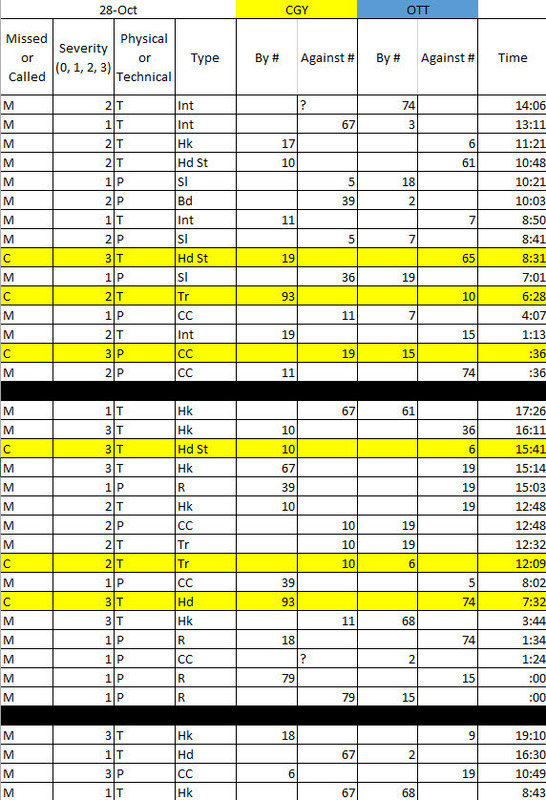 penalized 4 more times as well (17%). absolutely hate tracking for infractions. Arizona is one, Anaheim the other. For reasons that will become apparent in a moment. 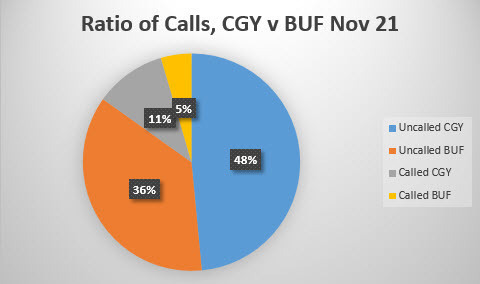 uncalled infractions yet also received 4 penalties (11%). Giordano was the most-targeted Flame in this game. calls (roughing, slashing, slashing, tripping, interference). infractions and received 3 penalties (12%). Jan 6 vs Vancouver – 4-2 loss, referees were Justin St.
while Matthew Tkachuk was the most targeted Flame. 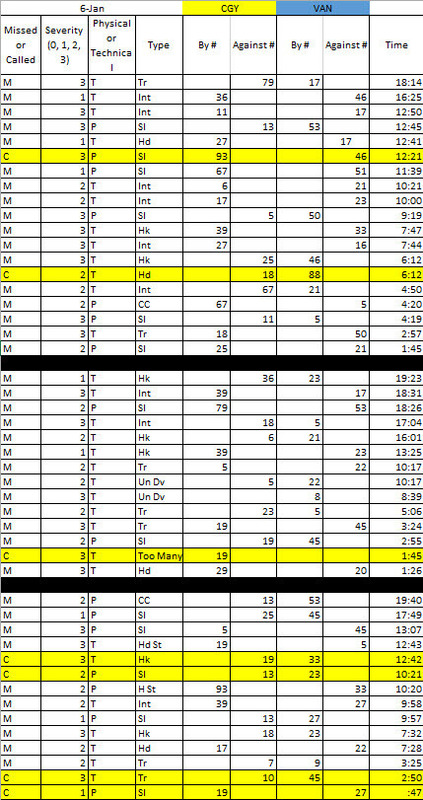 penalized 4 times on top of that (15%). misconduct (Tkachuk). 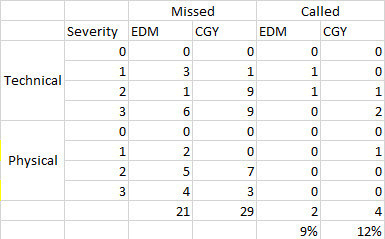 5 more penalties were assessed in the final period. of committed fouls by the Predators. 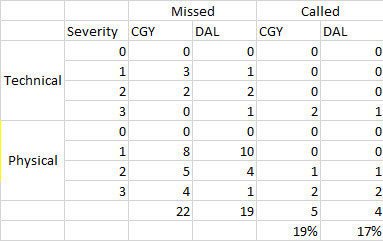 physical fouls compared to only 2 by the Flames throughout the game. fouls compared to a relatively small number, 2, by the Predators. earlier, for anyone who wishes to follow the work. I’ve read that and several articles relating to referee bias over the past few months. 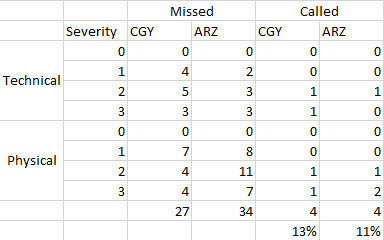 I am careful in the conclusion to say that the Flames are receiving more penalties at the same time they are committing more infractions and that, in my opinion based on recorded observation, this is due to a combination of them no longer receiving the benefit of the doubt and a change in overall coaching strategy under Gulutzan. I interpret the Wideman Curse to mean that the Flames are being directly targeted by the referees and being penalized when there is no fair cause when it appears that there is a very real cause. The bigger question is how to avoid dumb/selfish/lazy penalties and how to draw more penalties. Then how to get the 1st PP unit back on track. Maybe start with Backlund unit? Yes. Cut back on the boneheaded penalties like holding the stick and hooking and start running the PP units based on their actual efficiency rather than what schemes and pairings the coaches would prefer would work. I still believe in Wideman curse. Entire post was written by an Oilers fan, why would I bother reading? Just a stab in the dark here but, you could approach it with an open mind and see what happens. You work on this is impressive, and exhaustive Rex. It’s really admirable to see someone dedicate their effort and skill to a worthwhile thing. And it is subjectively assembled data. Maybe if you viewed these games with a panel of reviewers that each scored the game on the same criteria, you might get something resembling a consensus as to what exactly is a ‘borderline’ call, missed call, etc..No offense but you’re one guy with one pair of eyes. I don’t have to mention you’re an Oilers fan, but there, I just did. Not that I’m questioning your objectivity. My theory is that it’s not a league- wide conspiracy (perhaps was but not any longer), rather it’s a few refs that hang onto their own bias. But it’s still real. Referees are unfortunately human, and therefore can have a very difficult time being completely objective. Some of the Flames are chippy, some are chirpy. It would be reasonable to assume that not all referees come into each game with a completely empty file on the team. You gotta think refs talk just like players do. Close opposition penalty numbers can sometimes fall into the ‘even up’ category, which is another outcome of humans making decisions with some sense of ‘fairness’ at play. 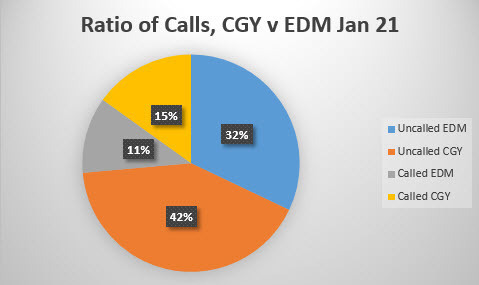 It would be interesting to see more data (read: all games) and correlate the data from the lopsided games where ‘phantom’ calls and ‘borderline’ calls put the Flames at a disadvantage more of the time check to see if there was a relationship between the Flames and specific referees. That to me is the most obvious place to look. These are all excellent points and believe me I am aware that a single-source viewing does carry inherent risks for data collection. It is why I include all my raw data so that anyone can go back to a game, check the time on the clock and judge the play for themselves. Handling watching a Flames’ game as an Oilers fan is an exercise in forced neutrality, and you are right to bring it up in that context. All I can say is that my commitment to this project, because of it’s size and time requirements made me want to make more certain of getting it right than settling any scores with Calgary. You mention the phantom calls and that’s a good point. If I were looking for a real grudge against the Flames, that’s where I’d start and yet I barely recorded any in the sample I took. In fact, none that I can recall right now. 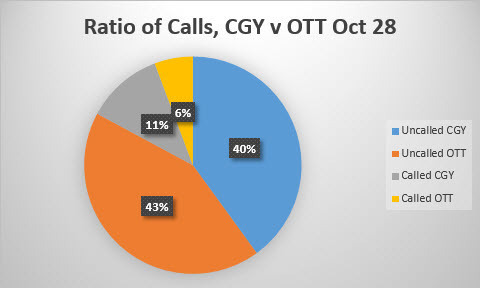 This is surprising because I’ve recorded more phantom calls IN FAVOUR of the Oilers and the other (control) NHL games I observed. This is partially why I came to my conclusion, backed by what Fraser wrote, that rather than “having it out for the Flames”, the refs are exerting a more demanding level of professional detachment when officiating the Flames than they might other teams. In response to that, I can say that I empathize as a fan as we watched Taylor Hall have a few episodes with officials in his rookie season and his penalty differential completely dried up as a result. It is infuriating, but it appears to be something of a fact of life in the game. I had written a long response to this but it appears that it failed to load. Suffice to say, I think we could discuss this at length and come away with far more in common and a better understanding of what it’s like being a fan in this league. Thank you for your points! Thanks, Rex! See you in the first round. Holy crap. Great work Rex. Show either of those charts Burnward posted too a non-hockey statistician and see what they say. There is no way that such a huge change happens to the number of penalty calls just “coincidentally” at the exact same time as Wideman is hit by a ref. You are living in La la land. My problem with this is not actually the issue of the flames losing games thanks to refs. My issue is that this proves quite conclusively that the NHL is biased. There is no way they were not aware that the Flames were receiving more penalties. It was spoken about way to often by media, fans etc… The NHL did nothing about this situation. On the chart posted you can see quite clearly the “trend” is returning to normal. Does this coincide with Burke speaking to league? If so would just reinforce that the bias existed. What other bias exist? I never believed in conspiracy theory crap around the NHL wanting big market teams in playoffs, finals etc…… But now….. Having shown they will condone this crap I am starting to wonder. Do they encourage refs to call games against teams they do not want to succeed? So much for the integrity of the game. Well Rex, I see you are totally invested in the belief that data is the truth. I’d believe all this if the officials weren’t human. Hockey is a form of Entertainment. Like many forms of entertainment it’s loaded with emotion. I don’t see how anyone could support the theory that The NHL Officials Association has developed a standard that is applied accurately. 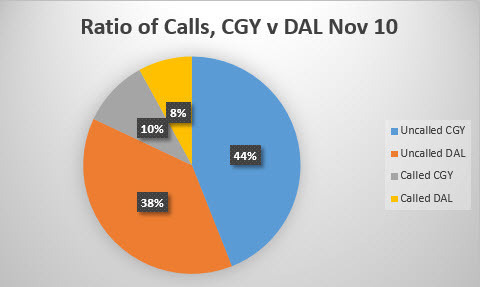 I’ll use the example of how calls change come playoffs, and change even further as the stakes get higher. In the future the game will probably be officiated by artificial intelligence, but right now its officiated by flawed officials. I wrote on that last spring after covering the SJS/LAK series. I think refs do have some bias but it trends towards managing the game and trying to even-up the calls as best as the situation allows. Real nice article Rex and that must have been a ton of work, but I can’t help but think there might be something to this even if it is not as pronounced as the average Flame fan thinks. Burwnards’ graph is quite telling. The penalty differential started to reverse immediately after the Wideman incident while Hartley was with the team (not just because of GG’s new system). Interestingly… Hartley’s response to the refs was always one of contempt and full blown anger from the bench. Given Kerry Fraser’s article it’s hard not to imagine the reversal in penalty differential last season wasn’t in part due to the ‘Wideman effect’ – especially with Hartley on the bench. When GG started the year it almost seemed like he was doing everything possible not to get mad at the refs… his calm approach to me seemed like him trying to get the team back in the good books. Eventually he’d had enough and you could see him start to break down on the bench and yell at the refs and I recall one post-game presser where he said ‘our team doesn’t usually get any breaks’ or something to that effect. I would venture to guess this was about the time the league was speaking to the Flames org as reported by Friedman. To me it was as though GG had given up on his attempt to become the nice guy with the officials. GG was probably in on the meetings and fully aware of the response from the league that ‘nothing was going on’ and I suspect this is when he lost the calmer approach. I can appreciate the amount of conjecture in my opinion here… but it’s how I see this season has gone (having watched most every game) and the timing seems to fit. Those are all very good points. There may be something to how refs deal with a rookie(ish) coach, also. With regards to the graph above, the trendline is interesting, but let’s keep in mind here that we need to pay close attention to context. For instance, by how much, per game, do the penalty calls go up? Is this across the league? Does this occur only in games the Flames play? Which referees are working those games and were they on the team that officiated the night Wideman hit Henderson? Pulling an emotional response from a single chart or graph is dangerous. I’m not trying to entirely debunk or dismiss how Flames fans feel here, but rather wanted to bring some empirical observation to the discussion. The refs put their whistles away during the playoffs. I guess everyone is entitled to an Opinion including me.. Cheers! Without doubt the most boring article I never read. Wow how can you be so blind to such an obvious situation even on sportsnet they agree it is Bios from refs but being an oilers fan and we all know the Oilers paid the NHL tons of money to get Conner and conveniently enough the first over all pick changes after they get there man Ohh what a shock. Bios No not here go back and write for your team stay off of here. uh sportsnet has a huge bias to the team they cover. Yeah… no. The Flames are almost entirely the same skaters as the team that took the fewest in the league. Sorry, I think your intentions are honest buy I can’t help but think that you worked towards proving a preconceived outcome. Sorry, I don’t buy it. For what you’re saying to be true a team composed of largely the same personal would have to do a 180 on infraction commitments at precisely the same moment that the refs gained an incentive to tilt the calls against them purely by coinsidence. Nope. Don’t buy it. Uhh I would say Bollig in the AHL all year kind of counteracts the grit Tkachuk has brought with his game. Tkachuk is also a distant runner in the Calder where Bollig had his role pretty well defined. While I applaud your effort Rex, I confess I’m not convinced. You went into the exercise with a personal bias and confirmed it by tabulating judgement calls that are susceptible to personal bias. Also, you have no frame of reference for comparison. You’d need to have done the same thing for other teams to be able to say what is normal and what is not normal in the NHL. Also, it’s worth pointing out that refs, if they really wanted to deliberately screw over the Flames, would probably not stack up hundreds of spurious penalties over the course of the season. 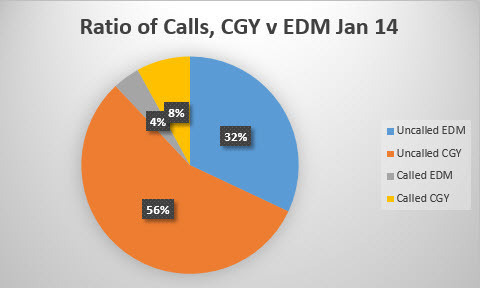 Rather, they’d just add a few key calls against the Flames and no-calls on their opponents at key moments in the game. 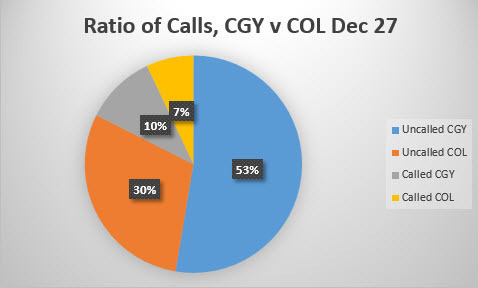 So, you’d really need to look at the timing and impact of calls. On the other hand, I’m not convinced Wideman effect is real. I don’t think anyone speaking publicly has really put in the work to prove something fishy is up. A few bad calls at the right time is all it takes for the media to pick up on a story like this, so their interest proves nothing. Presumably they would feel some responsibility to avoid maligning the refs without good cause, but selling copy is often King with these guys. The fact that the Flames have spoken to the league about “Wideman effect” is more suggestive, but we don’t have access to their stats. I would assume they didn’t just go into that meeting with empty hands and an unbacked opinion. Also suggestive is the huge increase in PIM over last year despite relatively little roster turnover. Blaming it all on Gulutzan’s new systems is not wholly without merit, but also a little hand-wavy. You might back it up a little better by noticing the fact that Vancouver’s PIM went way done this season with Gulutzan gone, but how much impact does an assistant coach really have on team PIM? Bottom line, I don’t really know what is going on. Something smell’s fishy and I am suspicious, but I have no proof. What you have done here, while a tremendous effort, does nothing to dispel those doubts. The fact that so many fans now have legitimate doubts about the impartiality of the NHL’s officiating is a big problem for the league. Whether “Wideman effect” is real or not, I think the league needs to do something to address public perception of it. Also suggestive is the huge increase in PIM over last year despite relatively little roster turnover. Blaming it all on Gulutzan’s new systems is not wholly without merit, but also a little hand-wavy. You might back it up a little better by noticing the fact that Vancouver’s PIM went way down this season with Gulutzan gone, but how much impact does an assistant coach really have on team PIM? Belochs point about the Wideman effect being present last season seems valid to me. I think that we’ve seen things even out a bit in the last while. Refs are human, yes, and I really couldn’t see them pursuing some sort of vendetta a year later. Our problems this year stem from Tkachuk being new and Bennett being frustrated. Paul Stewart also does blogs regularly & there was one a few months ago (sorry I haven’t tracked down the link) but it was clear the referee brethren are not happy that Don Henderson’s career is done & out all that income & Wideman was able to get his suspension repealed & recapture a large amount of the loss of pay. From a psychological point of view, if the officials union is upset of the outcome of a horrible incident, that bias will come out automatically at the sight of Wideman on the ice each game. Personally, Wideman should have been kicked out for the balance of the year without pay. Trelivings biggest mistake was he should have bought out Wideman knowing this backlash could be very real. Beloch – This is the second time I’ve run this project and I state in the article that I also collected data on a corresponding number of non-Flames games. I did not include that data in this article because as it stands now, people are uncomfortable with the length of it. Over the two years I’ve run this project now I have arrived at an average officiating rate of between 16%-18% of all infractions being called. That rate changes based on the severity of the infraction, obviously, and that information is included above. I do acknowledge my bias and make a concerted effort to adjust for that. I realize that this is, for some, a terminal flaw in the exercise. My only defense to that critique is to say that if I’m going to sink 100s of hours of my own time into a tracking project, the majority of which nobody will ever see because it forms baseline information, then I am absolutely going to try my best to make sure it is as objective and logically sound as I can possibly manage. You raise some good points and I’m glad you’ve brought up the issue of bias because it needs to be discussed. I don’t mean to convince you against your existing opinion, rather I want to bring some more information to the discussion. Thanks for reading and thank you for the well thought-out reply. I’ll take a look at that link you mentioned. I’ll save you some excel perusing: The moment Wideman destroyed the ref, the scales tilted heavily against the Flames. These are facts. The numbers can be selected to to tell any story but anyone watching the Flames every game before and after knows that the refs are punishing the Flames. That said, the refs are poor quality in general and as an organization have a thin skin. No one can get better at their job if they can’t take criticism. No one. 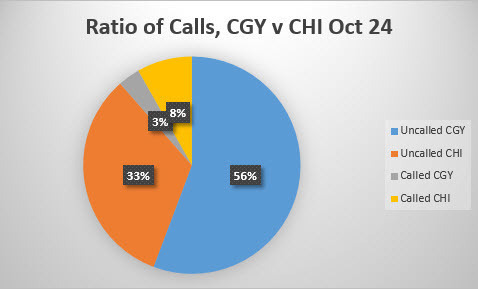 The real test will be whether or not the flames number of calls goes back down now that Wideman is more, or less, off the team. 1. You don’t have a control group. You need to compare pre Wideman suspension games to post Wideman suspension games to provide a null group. Thats basic statistics (right now you are assuming the pre-wiseman group is perfect and you can’t do that to have a valid argument). 2. There is ALOT of judgement here. My suggestion would be to have another review these games AND have 10 random games be independently looked at. I’m certain there is some bias. The main reason being the same roster which was 1-2 standard deviations less than normal on a Bayesian assumption immediately moved to 1-2 standard deviations more than normal with the inflection point being the Wideman incident. I could spend some time backing out this likelihood but even a pre-schooler can tell you its unlikely in the extreme. Next year Wideman is gone. Ignore the first say 20 games. Lets see where Calgary is on penalty differential. That will be a better indication of bias. You did a lot of research, thanks Rex!! Your stats, while good and well researched are just that… Your stats. What you precieve as a penalty technical or physical, called or not called and the severity, is your bias opinion (it’s ok, we all have them). As stated in the opening paragraph, you don’t believe in the “Wideman Effect” and have attempted to educate the Flamesnation followers of your mindset through your own information and opinions. I’m sure you could look at 12 different games throughout the season and find the exact opposite results of your conclusion, especially if it was an “un-bias” flames fan doing the research. Thanks for putting this together Rex. Good stuff. A lot of NHL fans, myself included have complained the games are called unevenly. There are many instances where referees appear to make “even up calls” in an effort to negate a bad or missed call. Worse yet the idea that penalities are called to balance the number of calls made between opposing teams. Thankfully, your results don’t support this idea, since the rates are generally close. The observation for me is that statistically it pays to cheat. 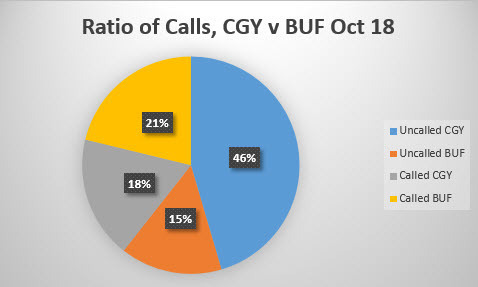 It appears that the rate of calls made drops as the number of infraction increases. If this is true, it’s disapponting even if the Flames are large benefactors this year. While these teams a still forced to play short handed more, they get away with being cheap and slowing the games down. I’m really curious to see the infraction rate for the Ducks, Kings and Coyotes. Three teams that use infractions as part of their defensive schemes. Bingo Which is pretty sad because it speaks to the integrity and professionalism of the people running the league. The league has a problem here, and it’s growing. Yes, I’ve come to a similar conclusion regarding “it pays to cheat” and I think that fans who watched their team play the Ducks and Kings for the last few seasons would probably agree. I reviewed the SJS/LAK series last playoffs and was surprised at how much LA got away with against Pavelski and others…right up until SJS started to pull away in the series. It was odd because right around that point the refs began to come down on the Kings for things that, only a game or two earlier, had gone completely unpunished. Now, it was a different officiating crew, granted, and that is going to change things, but to see a trend gradually reversed almost because a team was winning, rather than them winning because the trend reversed, was intriguing. Again, one series and only two teams, but something to keep in mind.